I found this recipe here. I have in fact eaten wings at the Anchor Bar in Buffalo, NY. It was years ago, so I can't say that these are exactly like them. I will say that these wings were easy to make and really good! I would probably double the sauce recipe the next time I make these wings. In a bowl toss the wings with the oil and salt. Place the wings into a large Ziploc bag and add the flour. Remove the wings from the bag and shake off the excess flour. Spread the wings out evenly on a very well oiled foil-lined baking pans. (I didn't put enough oil on and some of the wings stuck to the foil and were hard to remove.) Do not crowd the wings on the pan. 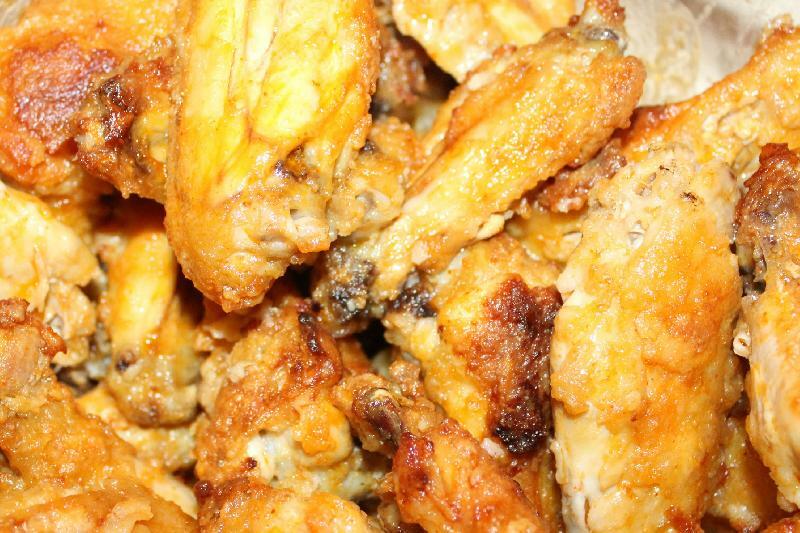 Bake the wings for about 20 minutes. Then turn the wings over and cook for another 20 minutes or until the wings are cooked through and browned. While the wings are baking, mix all of the ingredients for the sauce in the pan. Over low heat bring it to a simmer. Stir occasionally and then turn the heat off. When the wings are cooked place them into a large mixing bowl. Pour the sauce over the hot wings and toss with a spatula to coat completely.